The Countryman EMW Omnidirectional Lavalier Microphone is designed to reproduce vocals, musical instruments and ambient audio sources with pristine detail and minimal handling noise. The capsule is highly resistant to moisture making it a suitable solution for outdoor use, placement against skin, etc. Clear audio reproduction with low rubbing and handling noise is a result of the EMW's omnidirectional polar pattern. The peaked frequency response is well suited for compensating for high frequencies that are lost when mounted underneath clothing. A wide variety of colors and connections are available, this version is cocoa and features a 3-pin XLR connection. The EMW is available in three frequency response types and this version features a peaked frequency response that compensates for high frequencies lost when mounted underneath clothing and fabric. 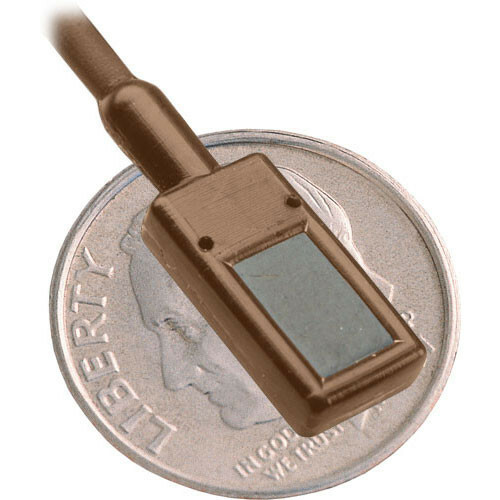 The square EMW lavalier is available in various colors that virtually render the entire microphone invisible against the skin. For more information on which color ear-set suits you best, refer to the Countryman support page. The attached cable is made of a durable, break-resistant Kevlar for rigorous use without shorts and wear. This square, moisture resistant capsule is ideal for use in humid conditions, on skin, outdoors, etc. EMW Omnidirectional Lavalier Microphone with Peak Frequency Response and 3-pin XLR Connector (Cocoa) is rated 4.8 out of 5 by 4. Rated 5 out of 5 by Cruce the Documentary Filmmaker from Quality Rugged Lav mic First of all, I just want to say that this thing is tough! My main reason for buying this mic, is the the water-resistance and the rugged-ness. You can put this thing in any situation and it will perform. Sound quality is great. The carry case it comes with is actually one of my favorite things about this kit. The mounts it comes with are great but I recommend buying more for other situations. Beware, the kit already comes with a belt hook for the XLR, you do not have to buy one externally like I did. Overall, this is a rugged bang for your buck and I will be buying more specially wired for wireless. Rated 5 out of 5 by Anonymous from Perfect for filming interviews Being an audio professional, I was hoping to find a quality product within budget for a current project. I had resigned myself to the thought of less than stellar quality until I found these. The sound is rich, full and crisp. The cable is unobtrusive, easily hidden and the viper clip is the best. It holds the cable very securely and goes anywhere. Big thumbz up! Rated 5 out of 5 by Anonymous from Excellent WIRED Mic This mic produces excellent sound, even when under the talent's clothing. It's wired, not wireless, but you probably already knew that. Rated 4 out of 5 by BrianP from Awesome Mic! Very nice mic, love it.